This oven mitts is suitable for indoors and outside. A non-slip heart design with a strong grip that allows safe movement of hot pots, food or racks. 425F max operating temp, non-slip surface, water proof, stain and odor resistant, food grade for handling hot or frozen foods directly while protecting your hands from spills and burns and preventing accidents from slips. Washes easily and dishwasher safe. The most versatile kitchen tool for baking, cooking and grilling, they can be used inside the kitchen for baked goods, by the grill for barbecue chicken, frying a turkey, or even the fireplace. 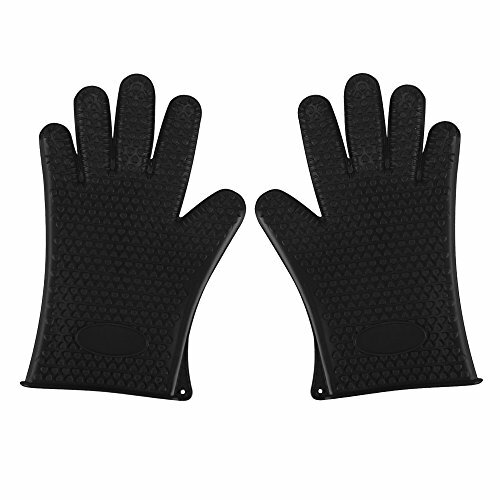 The silicone oven mitt set makes the best gifts for barbecue lovers. You can think of buying this pair grill mitts as a gift for your wife, mother, father, husband, girlfriend, boyfriend, brother, sister, friends, and co-workers and loved ones. Buy it for holidays, Thanksgiving, Christmas gift and much more.